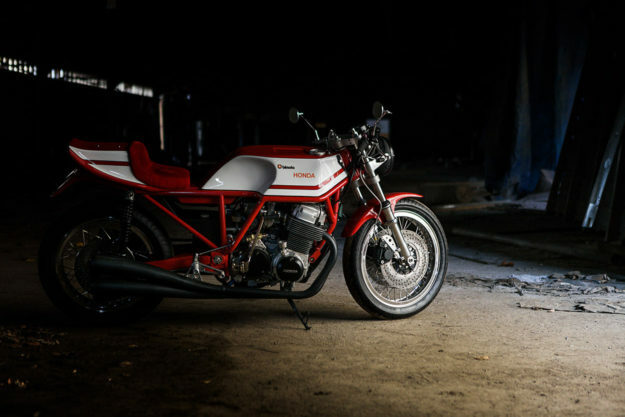 Bimota: It’s one of the most evocative names in motorcycling. 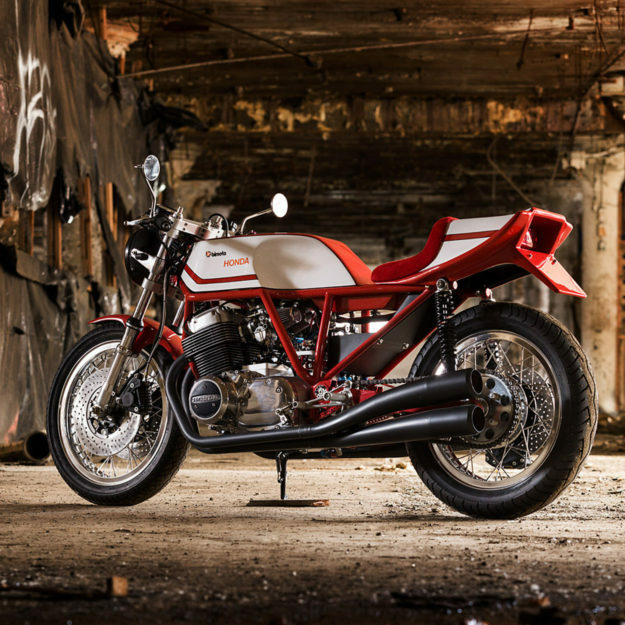 Like most Italian manufacturers, the company has been through the full cycle of fame, financial crisis and rebirth—but the star power of the bikes bearing the name has never waned. 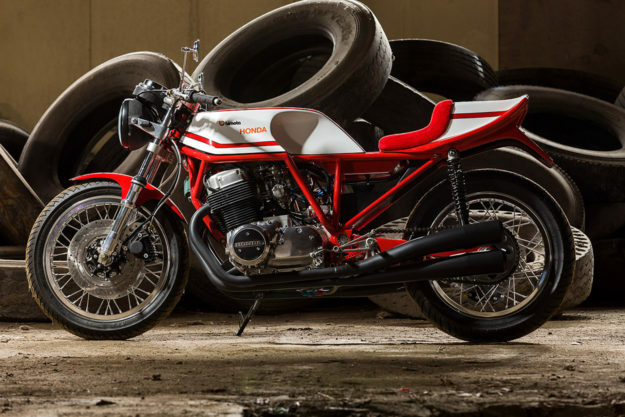 The Bimota story started in the early 1970s with the HB1, built around the Honda CB750 engine. 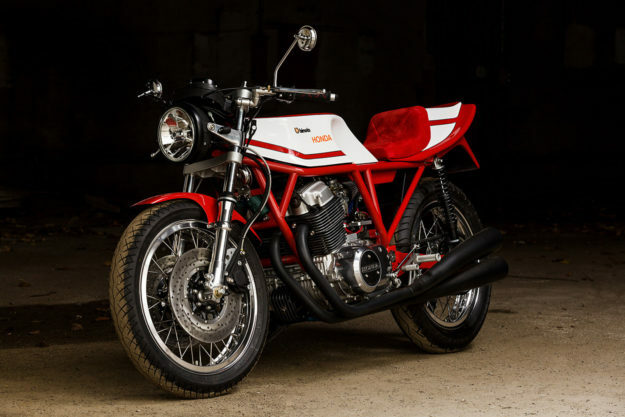 Only ten of these machines were made at the Rimini factory, and nine were delivered in kit form. Word is that just four built-up HB1s still exist, so prices are high: the auction house Bonhams has sold two over the past couple of years for around US$70,000. And there’s a strong enthusiast network—but we’re not sure how owners will react to the machine shown here. 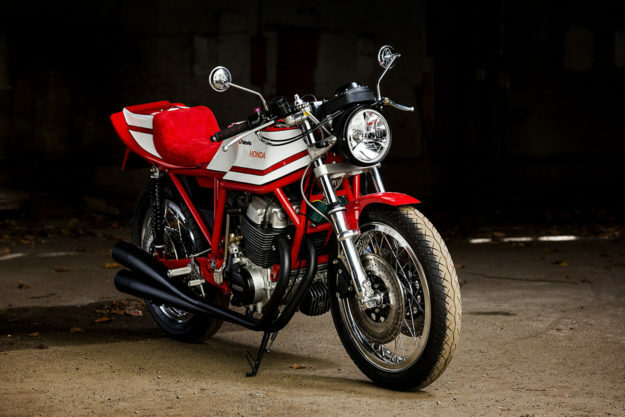 It’s a jaw-dropping HB1 replica, shot by top motorcycle photographer Ryan Handt and built by American Rob Phillips—best known as the man behind Husky Restorations, based in upstate New York. 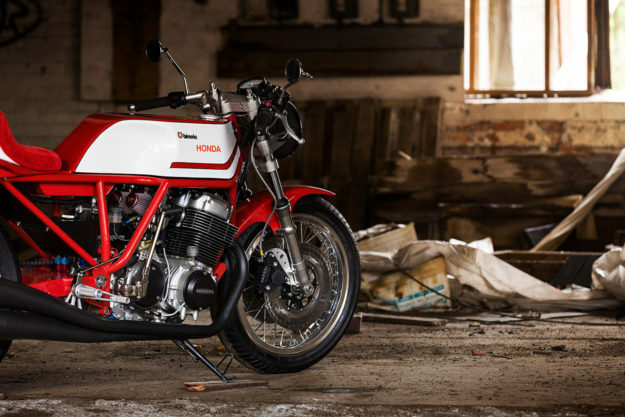 These days, Rob focuses on Yamaha HL500 restomods, but he also likes a good challenge. So he’s spent the past two years reverse-engineering the HB1 from photos and diagrams. Bimotas are all about the frame, and this one was built for Rob by Framecrafters of Illinois. It’s a work of art, and as close as you could get to the original without having the real thing on a jig to measure from. It’s a true stressed-member frame, built using sections that Rob CNC’d himself. A 1974 CB750K engine is slotted in. It’s a completely rebuilt SOHC/4 unit, boosted with a Megacycle cam in a smooth road race profile. There are K&N filters at the intake end, and for the exhaust Rob mandrel-bent a 4-into-4 system. He’s even CNC’d a set of custom hangers, and hand-made four Magni-style megaphone silencers to maintain the period vibe. 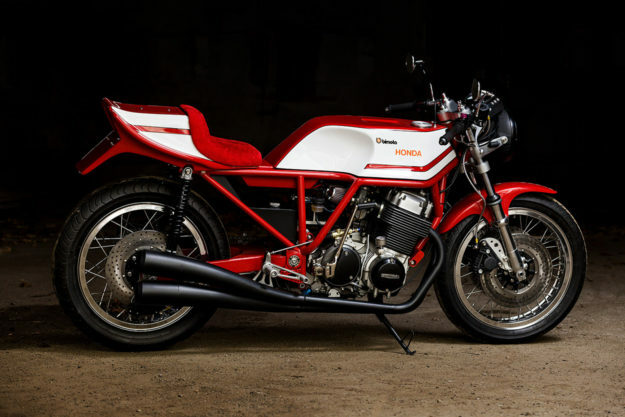 Oil is held in a custom tank made by Ian Halcott of Twinline Motorcycles, and Rob has machined up new adaptors to fit a custom set of lines running into the engine, with an oil pressure gauge plumbed in. A Dynatek electronic ignition keeps the spark strong, hooked up to a tiny Antigravity battery. Bimota always used top-shelf suspension components, and Rob has located a set of adjustable Ceriani GP35R racing forks. They’re clamped with a custom offset triple tree, which can be adjusted up to five millimeters. At the rear, classic Marzocchi shocks keep the Bridgestone BT45 tires under control. The brake setup is custom too, with Brembo calipers and master cylinders, CNC’d caliper mounts and Hel Performance lines. The wheels are Excel rims laced up with stainless spokes by Buchanan’s; the axles and spacers are one-offs. The bodywork is carbon fiber, from the tank to the seat unit to the front fender. It’s a perfect facsimile of the original, right down to the paint and decals. The tank is even secured by a flexible rubber strap, just like the original. 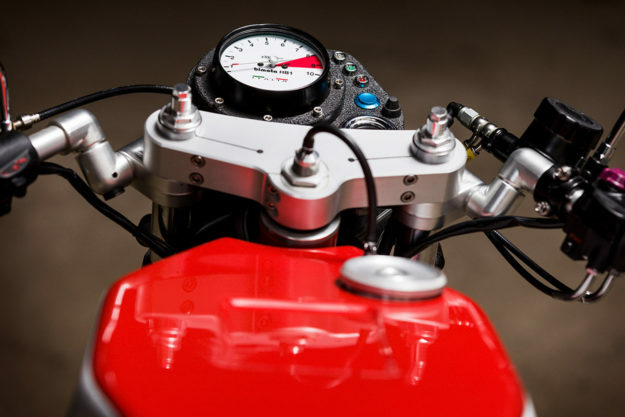 Off-the-shelf parts are few, but well-chosen—such as Tommaselli clip-ons and Tarozzi rearsets. And there’s a fair smattering of original CB750 accessories too, such as the headlight, bar controls and tachometer. The tach has been modified with an HB1 dial, and it’s supplemented by a Dakota digital speedo. Everything is wired into a Motogadget m-Unit control box. 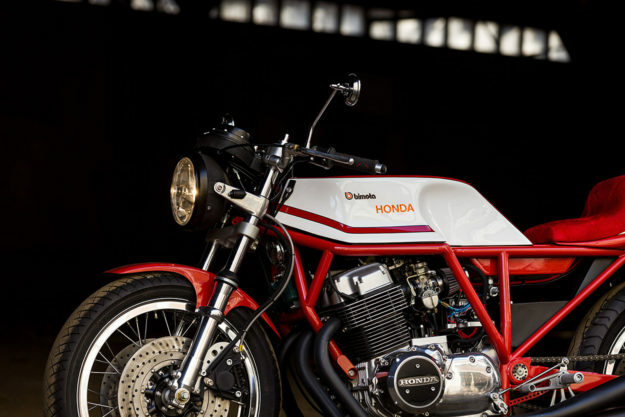 Having this bike in your garage would be like owning a restomod Bimota of the highest order. But it’s effectively a ‘new’ bike—providing the same experience new owners must have enjoyed back in the mid 70s. 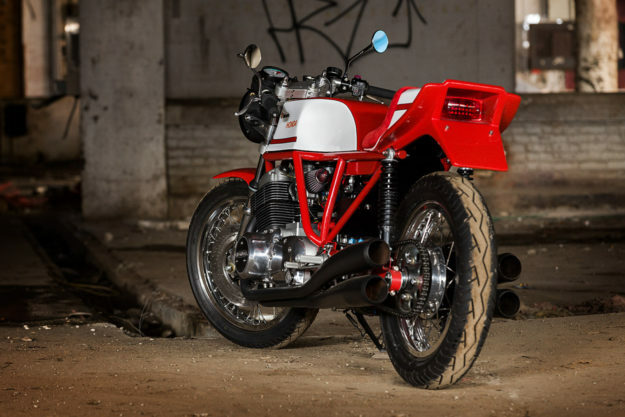 In these days of Photoshop renders and cookie-cutter cafe racers, it’s good to see that old-fashioned chassis engineering and fabrication skills are alive and well—if you know where to look.